Beginning 2014, it has become clear that BYOD (‘bring your own device‘) for small business has become an essential strategy, just as with the midsize and larger companies. Increased/enhanced productivity is what we all desire in our small businesses; and productivity surges when workers are happy in their roles and tasks. Giving them the leeway and a level of trust to use their own smartdevices on the firm’s network is one way that demonstrates trust– and that makes them happier (some anyway lol). At the same time, we do not wish that such ‘freedom’ negatively impacts on the efforts that went into building and operating our business. If you have already decided that BYOD is not for your company, then you may be surprised to know that elsewhere it’s already happening extensively. In fact, nearly 40% of info/tech workers in North America use their own smartdevices without their employer’s permission. Shocked, are you? 1. Increased security: If a worker misplaces her smart device, she will just need to alert us and we will wipe our information clean. If she finds it the next day under the couch, we can instantly redeploy it. This also applies to theft. 3. Secure content folders: If a worker or adviser departs the firm, the data is wiped. For bigger firms, this is a great tool (e.g., breakaway brokers, temps). 4. BYOD for small business compliance: The rules can apply beyond just specific apps. They can include measures on encryption, and limits or restrictions on data transfer. Equally useful if a smartdevice is stolen. 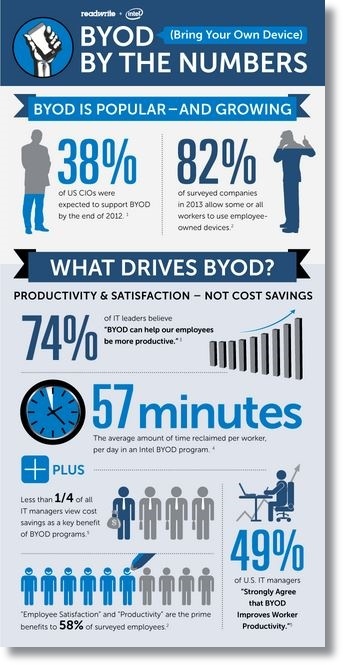 Have you addressed the BYOD for small business issue at your workplace? If not, what’s your delay? If so, how have you forged ahead and what rules and tech have you employed? jointly created by Intel and ReadWrite. Be sure to weigh-in with what you think in comments.